Several days ago I posted a list of food suggestions for a Valentine’s Day party from a hundred-year-old issue of Boston Cooking School Magazine. The magazine included the recipe for one of the suggestions –Valentine Salad–so, I decided to make it for my sweetheart. 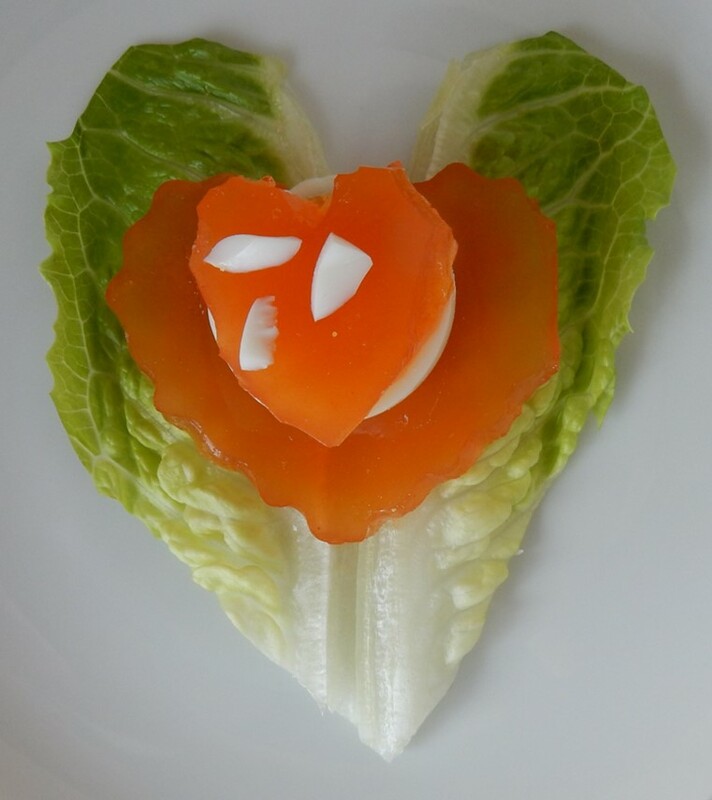 Valentine Salad actually was an old-time tomato aspic cut into heart shapes, with hard-boiled egg slices. The aspic is a jellied savory mixture of homemade tomato and other vegetable juices. The presentation was a bit much with the heart-shaped lettuce and aspic, but the Valentine Salad had a surprisingly nuanced and sophisticated tangy tomato flavor. My husband said it tasted like a Bloody Mary without the alcohol. Combine tomatoes, onion, cloves, parsley, celery, sugar, and salt in a large saucepan. Bring to a boil, then reduce heat and simmer for 20 minutes. Remove from heat and strain. Reserve the juice. In a small bowl, dissolve the gelatin in the cold water. Then add to the gelatin mixture to the hot vegetable juice. Pour into a flat pan approximately 6″ X 6″. Refrigerate until firm. Briefly dip bottom of pan in hot water, then slide the jellied mixture onto a plate. 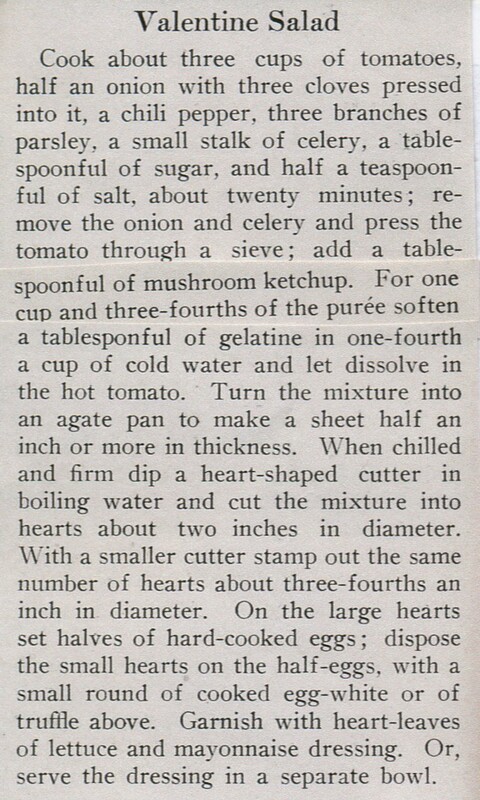 Cut part of the jellied mixture into hearts about two inches in diameter. With a smaller cutter, cut the same number of hearts about 3/4 inch in diameter. To assemble – For each serving, place a lettuce leaf on a plate, top with a large heart. On top of the heart place a egg slice, followed by a small heart. Garnish with small pieces of hard-boiled egg. If desired serve with mayonnaise. *The cooked vegetable mixture can used in a different recipe. For example, I served it over rice. Posted on February 7, 2016 February 7, 2016 by SherylPosted in Food, HolidaysTagged salad, tomato, valentine's day. Yes, it was quite attractive, and the food design was very creative in an old-fashioned way. Awwww–that’s so sweet! I hope your honey appreciated all the trouble you went to for him! I was interested to see the cloves in the recipe. That was a touch I wouldn’t have expected. It certainly makes for a pretty plate. I wondered about this recipe in your last post, so I am glad to see it show up all by itself! I know aspic was common around then, but somehow, the thought of it has never appealed to me–but this is still pretty! Like you, I knew that aspics were popular back then, but I wasn’t quite sure what to expect. I actually was pleasantly surprised by how it tasted. It wasn’t sweet like modern jellos, but rather had a nice savory tomato taste. You are absolutely right. It is nice to see a Valentine recipe that isn’t a sweet. This dish would definitely make a table look festive. To serve it to my family ,I would have to swipe out the egg and put a little dab of ranch dressing on the heart with a black olive in the center of the dressing. I like that suggestion. It would look very nice. One of my favorite things about cooking is adapting recipes. That it is so different from what we see today is wonderful. I would never have thought to use lettuce for the heart shape. I find it really interesting how people back then were into food art–it just was quite different from the food art of today. It looks good. I have never heard of gelatin that wasn’t sweet. I learned something new today! Have you ever come across an agate pan? That’s a new term for me. I’m not positive (and readers may need to correct me) but I think that it is a blue-speckled enamel-covered metal pan. I believe that it was made out of the same material as some roasting pans that you still see today. I wondered if it might be something along those lines. 🙂 They sure did put a lot of effort into creating foods like this recipe. Reminds me of the Bunny Salad with pear halves on lettuce! I always wondered what aspic was! I often learn something new while reading your blog. Like Ann, I was not sure what aspic was. It turned out quite lovely and I can see it served on a really special plate to go along with the Valentine theme. I am going to pass this on to my husband. He has taken to cooking and baking in a big way the last few years, while I have sort of done the opposite. My husband also cooks more than he used to–particularly week-end breakfasts. I’m happy to have discovered your blog. Your aspic is nice…you don’t see them prepared much here but in our travels in Germany and Austria aspics are still very popular and served in some of the top restaurants. It’s interesting that they are still popular in Europe. We are missing a good food here. If I wasn’t making this for Valentine’s Day, I could see making the aspic, and perhaps molding it and embedding the hard-boiled eggs. Hmm. . . this is starting to almost sound like a different recipe. Maybe I’ll have to give it a try. Now this is what I call ‘romantic.’ Thanks so much for sharing, Sheryl.